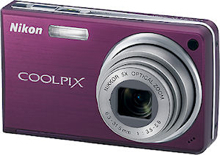 The Nikon Coolpix S550 elegantly packs advanced functions and high performance into an ultra-compact body. The Coolpix S550 boasts 10 megapixels of sharp resolution, a 5x Zoom-NIKKOR lens, and Electronic Vibration Reduction (VR) Image Stabilization and two new modes that enhance portrait photography: Smile Mode, which automatically triggers the shutter when the subject smiles, as well as Blink Warning, which displays a warning message when the subject has blinked. The COOLPIX S550 will be available in an array of new colors – plum, cool blue and graphite black – allowing consumers to not only express themselves with their photos, but with their cameras as well. The Nikon Coolpix S550 will have a retail price of $229.95 when it becomes available in March. This entry was posted in Nikon and tagged Coolpix, Nikon on March 7, 2008 by jonathanb.